Global brewing giant SABMiller is buying Dutch beer maker Royal Grolsch for 816m euros ($1.2bn; £583m). UK-based SABMiller, the world's third largest brewer, said it had secured the backing of Grolsch's board. The offer represents a 84% premium over Grolsch's average closing share price during the past month. Grolsch is best known for its lager of the same name, which is traditionally packaged in a distinctive bottle that has a swing-topped cap. SABMiller owns a portfolio of well-known beers, including Italy's Peroni, the Czech Republic's Pilsner Urquell, South Africa's Castle, and US brand Miller Lite. 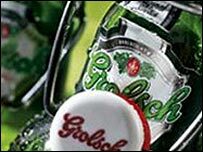 "Grolsch is an iconic Dutch brand whose rich Northern European heritage and premium positioning will complement and further build SABMiller's existing international brand portfolio," said SABMiller in statement. "SABMiller sees significant additional potential for the Grolsch brand across Africa and Latin America, where the premium segment is still in its infancy, and in the more developed markets of Central and Eastern Europe." Grolsch is currently brewed both in Holland and under license overseas. "We look forward to continuing to build our position as a premium brand within the new family," said Grolsch chief executive Ab Pasman. There is a growing trend for consolidation in the beer industry, with Scottish and Newcastle recently rejecting a hostile bid from Carlsberg.